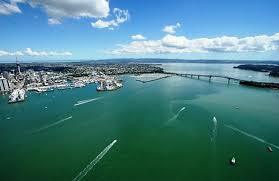 Its important to check tide times in Auckland as like most places on earth Auckland’s sea level is effected by tides. 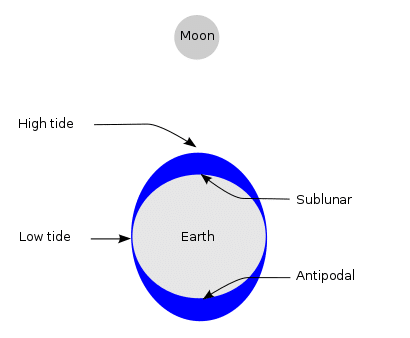 Tides are the rise and fall of sea levels caused by the combined effects of the gravitational forces exerted by the Moon and the Sun, and the rotation of the Earth. Tide tables can be used to find the predicted times and amplitude (or “tidal range”) of tides at any given locale. The predictions are influenced by many factors including the alignment of the Sun and Moon, the phase and amplitude of the tide (pattern of tides in the deep ocean), the amphidromic systems of the oceans, and the shape of the coastline and near-shore bathymetry. They are however only predictions, the actual time and height of the tide is affected by wind and atmospheric pressure. Schematic of the lunar portion of Earth’s tides, showing (exaggerated) high tides at the sublunar point and its antipode for the hypothetical case of an ocean of constant depth without land. There would also be smaller, superimposed bulges on the sides facing toward and away from the Sun. © 2019 Mission Bay Watersports.